Are you looking for a review on Xiaomi Redmi 4A? Here you can read the detailed review of the latest budget oriented and most affordable practical Smartphone for general purpose use. With all the latest specs like a high-end Smartphone, Redmi 4A is rocking the mobile market and is available to the common public at a very affordable price. Let's find out its new features, pros, and cons. One of the most popular Xiaomi Redmi introduced Redmi Smartphone series with Redmi 1S in India in the year 2014 and got grand success in their entry itself. With that success, they introduced Redmi 2 and Redmi 2 Prime in 2015 and then Redmi 3S and Redmi 3S Prime in 2016. In all these ventures they got superlative success and this Chinese company started their Smartphone manufacturing unit in Tirupati, A.P., India. In 2017 they introduced Redmi Note 4 and within 45 days of their introduction over one million units were sold in India will speak about how popular these phones got in public. With a view to holding the craze for their Smartphones in the market, now Xioami manufacturers introduced a most affordable, high spec low Budget Smartphone for general purpose user is rocking the mobile market at present. Redmi 4A is a 5 inch (12.7 Cm.) IPS capacitative touchscreen display Smartphone. The resolution of the screen is HD (1280 x 720) pixels and 296 pixels density. Redmi 4A is Android version 6.0.1 Marshmallow Miui 8 operating system. The processor Redmi 4A is with 1.4GHz Cortex A53 64-bit Qualcomm Snapdragon 425 quad-core processor. This Smartphone holds 2GB RAM, 16GB internal memory expandable up to 128GB. The primary SIM can support 4G calls and data while the secondary SIM can support 2G calls only. Like any other Redmi Smartphones, it is a Hybrid Sim adopter phone. Redmi 4A include 13MP primary camera with 5-elements lens, f/2.2 aperture, PDAF, high dynamic range (HDR), panorama, 1080p full HD video recording and 5MP front-facing camera. The capacity of the battery of this Smartphone is 3120 MAH lithium-ion battery providing talk-time of 39.3 hours and standby time of 168 hours according to the information given by the manufacturers. This device gets one year's manufacturing warranty and 6 months warranty on inbox accessories. This unit doesn't get any headphone or earphones. This Smartphone is available to the public on Amazon.in e-commerce site at specific date and time at a price tag of Rs.5,999. 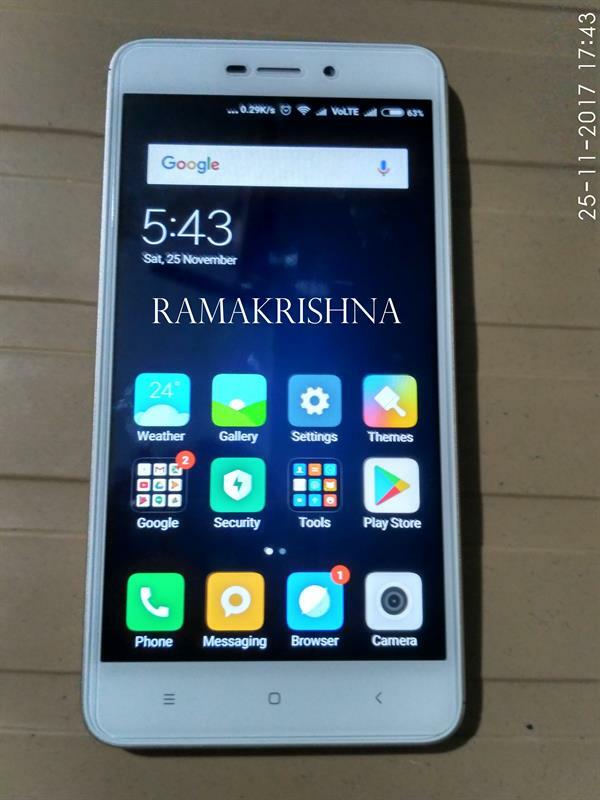 Redmi 4A is actually a budget-oriented Smartphone but the manufacturer still provided all the high specs what they have used in the more cost-oriented previous Smartphones of Redmi series at a very affordable price of Rs.5,999 will attract a large section of general purpose Smartphone customers. So the customers never get disappointed with this phone. Redmi 4A supports VOLTE (Voice over LTE), receives 4G signals with efficiency, call quality is very decent. The browsing experience is quite good with pages loading at a good speed and watching videos on this phone is also very satisfactory. Having these impressive features for a budget-oriented Smartphone is a plus point for Redmi 4A. Another plus point for this Redmi 4A is, for an entry-level Smartphone like this is provided with a 13-megapixel rear camera and 5-megapixels front-camera. Both rear and front camera's work superb under natural day-light conditions which stuns us with decent images. The pictures obtained through this camera are sharp with a decent amount of details. But under artificial light conditions, the images will be somewhat average but nevertheless not bad. The Camera functioning is also aided by LED flash, low-light enhancement support, HDR, panorama, manual, HHT, burst mode, beautify mode, and face recognition etc. Video recording feature also works quite good with easy mode of operation. In display section also Redmi 4A fares well with bright, vivid, clear and with adequate color reproduction. Text, images, videos appear very clear on the Redmi 4A screen. Reading mode feature will reduce strain on eyes while reading and color setting App. helps to view images and videos with great comfort. The other impressive feature of Redmi series manufactures is that they are providing large capacity batteries to their Smartphones which one cannot find in manufacturers of other company Smartphones. Even for a budget-oriented phone like this, manufacturers are providing a large capacity 3120 MHA battery which lasts at least 9 hours for average users. For minimal ordinary users, it may give 2-3 days support without recharging. Except for few minor variations Xiaomi is using the same technology for all its Redmi series phones irrespective of its cost range is an advantage one can be found in Redmi 4A. The only difference you can find in RAM and ROM variations, a marginal difference in the use of processors otherwise the same specifications and technology were used on all its Redmi series phones. In other manufacturer phones according to the cost range tech specification range also changes. In all Redmi series phones, a RAM of 2 GB and a ROM of 16 GB and above only one can find. Due to this Xioami Smartphones never trouble while loading pages or viewing videos or no lags during multi-tasking. Actually, the previous Redmi series are using MIUI 7 interface support at starting but a low budget phone Redmi 4a using a starting interface of MIUI 8. So Xioami is not showing any difference in providing the latest technology to its phones with regard to its cost range. Redmi 4A includes various connections like Bluetooth, FM Radio, infrared remote, GPS, Accelerometer, Gyroscope, Compass, ambient light sensor etc. like its predecessors of Redmi series. You cannot find such sensors in other manufacturers low budget phones. Gaming experience is also good with Redmi 4A and games like Asphalt 8 and Dead Effect 2 can be played with any problem. Because of low storage and if we add more Apps. it becomes difficult for the set to be used for games and you may find lags in such conditions. Eventhough the outlook of Redmi 4A is quite nice and sturdy but one may feel disappointed when we notice the body of the device is made of polycarbonate material unlike other Redmi series units are made with the metal body. Loudspeakers used in these units are not loud enough to listen to the voice clearly in a large room and the ringtone also cannot be heard when you are in another room away from the device. Manufacturers have not provided even basic earphones with this unit. If you play heavy games and heavy Apps. you may face lags since the unit is provided with only 2 GB RAM and 16 GB ROM. So you have to use this device with limitations. One of the negative aspects you may feel disappointed is in Redmi series and Redmi 4A Smartphones you find hybrid SIM slots. So you can use one SIM and one SD card or two SIM's in hybrid slots. Because of this you loose freedom to use all three features at one time. If one uses the set continuously quite a heating effect will be found on the set nevertheless we can ignore this fact because it is quite common even with any other manufacturers phone too. Under artificial light conditions like any other Redmi series phones Redmi 4A struggles to produce very decent images but one mark them as below average. At this price range of Rs.5,999 you are not expected to get any Smartphone which is comparable to its features. At this price range, you can't get the specifications like 2 GB RAM, 16 GB ROM, 3120 MAH battery, Qualcomm Snapdragon 425 quad-core processor, various sensors used, IR Blaster, especially Camera with 13 MP rear and 5 MP front camera. So by buying Redmi 4A, you are nothing to lose but getting lot value for your money. Xioami manufacturers are providing regular updates of its latest features to all its millions of customers through MIUI interface and so you are always using advanced technology even with your old phones. If you are able to spend Rs.1000 more you will get a variant of Redmi 4A with 3 GB RAM and 32 GB ROM. So you can use the device with more freedom of space and go for heavy multitasking.